Good mystery, good characters and such interesting background. Set in a vineyard in Virginia in the U.S.A.; lots about wine and lots of history too. Who: At least 7 BookCrossers. There's still room for 33 more. Come & join us! Picked up at tonight's meetup and looking forward to reading this. Taking this to Meetup. If no one takes it this will be in the box under the shelf near the front door. Picked up for my mom at last BookCrossing Vancouver Meetup. ETA: She said it was too "easy" -- the level of writing was very low and she wanted something more engaging. She didn't finish it. Bringing it to Meetup tonight. If no one takes it, it will be in the box by the door! I liked the story about a woman and a winnery in Virginia. The violence at the end really bugged me. Picked up at the meet-up. Looks interesting. I enjoyed this one. Will read more by this author. This is now on its way to Erishkigal, who chose it out of Loriped & Shroffland's Mysterious Mysteries VBB. Enjoy! I thoroughly enjoyed this, and I'm with eicuthbertson: good mystery, good characters, and fascinating setting. I love when I can read a light fun book that I incidentally learn something from :-) I also like that Lucie has physical limitations, and how she deals with both the actuality and the perceptions of others. Something we don't see often enough. And I chuckled out loud when she referred to her morning-hair looking like Tintin~~heehee. 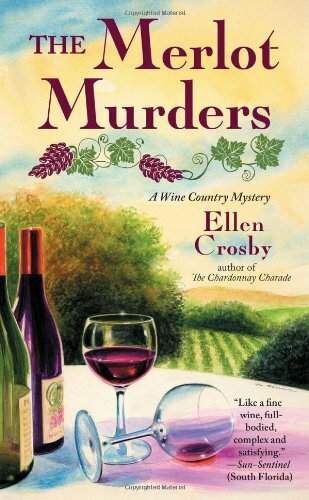 I will be looking for further Wine Country Mysteries, as I want to see how the vineyard and the characters grow. Interesting characters, and a lovely bubbly little mystery. (If it was wine, I'd say it was more chardonnay or spumante than merlot. Merlots needs more body... err, a few more bodies in this case, perhaps, and a few more dramatic, outrageous twists on the plot. Then again, I also thought that a drink with some rum from the Cayman Islands went well with this story). I like Lucie as character, and learning more about winemaking (in a bigger scale than home), and there definitely was a share of unpleasant characters too. I wish the bookcrossing meetings in Austin were as populated as the ones in BC... I'll see if I might end up releasing this around a nice Texas winery (I have one in mind, and plan to visit it soon), or perhaps the local meet here. Taking to the Austin BC meet today (I'd love to release the book in a winery, but visiting one isn't probably going to happen in a reasonable time... so hopefully some other reader will enjoy this meanwhile). If not taken, will be on the bookshelf. Safe journey little book - I hope you'll make many new friends on your travels! "Don't ever apologize to an author for buying something in paperback, or taking it out from a library (that's what they're there for. Use your library). Don't apologize to this author for buying books second hand, or getting them from bookcrossing or borrowing a friend's copy. What's important to me is that people read the books and enjoy them, and that, at some point in there, the book was bought by someone. And that people who like things, tell other people. The most important thing is that people read... "